Parents & Community – N. Kristina Leyva, Ed. S.
Parent engagement and involvement is crucial not just to the success of their student, but also to the success of the school as a whole. When parents contribute positively to a school, the atmosphere, culture, and public persona of the building shifts as well. Family and community involvements foster partnerships among schools, family and community groups, and individuals. These partnerships result in sharing and maximizing resources. What is the difference between engagement and involvement? Encourage active parent participation in student learning. Establish regular, meaningful communication between home and school. 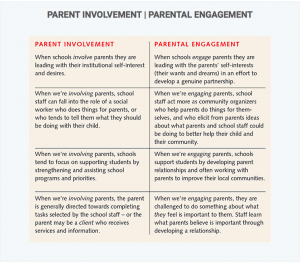 Collaborate with parents to ensure that children have a supportive learning environment at school and at home. Welcome parents as advocates for their children as well as the school’s other students. 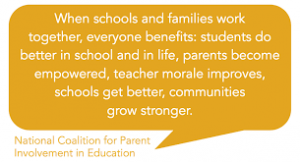 Invite parents to act as full partners in making school decisions that affect children and families. Reach out to the community for resources to strengthen schools. Be sure the first contact with parents is a positive one. Ask parents to share their concerns and opinions about school, and then address those concerns. Accommodate language and cultural differences. 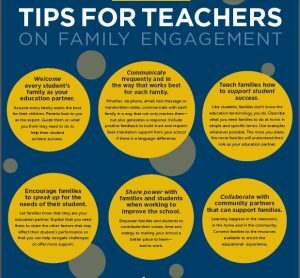 Create a school climate and structures that support family involvement. Provide families with a list of required mastery skills for each subject taught at your grade level. Invite families to share hopes for and concerns about children and then work together to set student goals. Set up a homework hot line students or parents can call to get forgotten or missed assignments. Print and send home monthly newletters with tips on how parents can support and engage with their child’s learning and school. Initiate a classroom volunteer program. Invite parents to present talks and/or demonstrations about their specialized knowledge or skills. Create a parent resource center. Provide materials on issues of concern to parents, such as child development, health and safety, drug education, special education, and so on. Include information about local parenting and social services agencies. If possible, provide sample textbooks, extension activities, software, and audio and videotapes. Weekly folders of student work. Monthly calendars of special events to be celebrated or taught. Weekly work sheets containing activities students and families can do together. Find ways to connect the curriculum beyond the classroom and bring in community leaders to help expand the learning experiences for students. 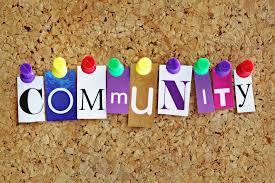 Community stakeholders want to be involved with schools, but often do not know how. Reach out to community laders and create authentic bonds as you share your dreams of a more enhanced communit-school partnership. Ask questions of what they wish to see happening in schools and invite them in to help make their vision reality. Reinvent the school experience. Reinventing school can mean lots of things such as redesigning classrooms, creating a community garden, creating an open and shared learning space, designing a course, changing the way students participate in decision making.